Great Falls —Henry L (Hank) Enochson passed away November 30, 2015 from natural causes. Visitation is one hour prior to the Funeral Service on Saturday, December 5, at 11:00 AM in the Rose Room Chapel at Croxford Funeral Home with entombment to follow at Hillcrest Mausoleum. Henry was born on May 9, 1929 in Great Falls, MT, the oldest of 5 children to Henry S. and Alma (Ballestad) Enochson. He grew up in Great Falls, graduating from Great Falls High School in 1947. He joined the United States Navy and proudly served his nation from 1948-1952 during the Korean War, returning to Great Falls in April of 1952. On May 24, 1952, Henry married Mary Jane Goggans. Together they raised their son, Rodger L. Enochson and their daughter, Juliann Enochson Gerrits. Hank served an apprenticeship and began his long career at Goggans & Pennie, Inc., Electrical Contractors. He and his wife took over the business in 1969. During his career, the firm completed many jobs from Thompson Falls and Missoula to Helena, Lewistown, Havre, and Glasgow as well as Great Falls, including buildings at the University, the Supreme Court building, the University of Great Falls and Holiday Village Shopping Center. Hank was a man of his word and well respected in the industry. He served 2 two-year terms in all offices of the Montana Chapter of the National Electrical Contractors Association, including 8 years as Governor. He belonged to Faith Lutheran Church, Cascade Lodge #34 A.F. & A.M., Scottish Rite, Great Falls York Rite Bodies, Al Bedoo Shrine Temple, Great Falls Shrine Motosikl Tauf, Elks Lodge #214, IBEW and the VFW. 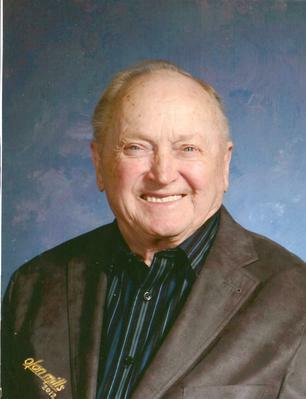 He was a long time member of the Uptown Optimist Club and served many offices including District Secretary of the Montana Alberta and Saskatchewan District. Hank loved his family, his home, and his yard. He enjoyed his big boats and the many summers spent at the Gates of the Mountains with family and good friends. He and Mary Jane enjoyed many cruises and trips from Alaska to Puerto Rico, California to New England, and many Canadian provinces. They also loved many winter months in Florida and California. He is survived by his wife of 63 wonderful years, Mary Jane; son, Rodger L. of Great Falls; daughter, Juliann Enochson Gerrits (John) of Rothschild, WI; his grandchildren, Andrea Lynn Enochson of Bozeman, and Eric, Scott, and Daniel Gerrits of Rothschild, WI. He is also survived by his two sisters, Lois Grolbert of Portland, OR and Dorothy Sigvardt (Bruce) of Salt Lake City, UT; sister-in-law, Carol Enochson of Vancouver, WA, as well as 9 nieces and nephews. Hank was preceded in death by his parents, Henry S. and Alma Enochson; stepmother, Alvina Enochson; brothers, Kenneth and Richard; and brother-in-law, Richard Grolbert. The family encourages gifts to Shriners Hospitals for Children , P.O. Box 2472, Spokane, WA 99210-2472, or the Scottish Rite Childhood Language Disorders Clinic, 1304 13th Street South, Great Falls, MT 59405.